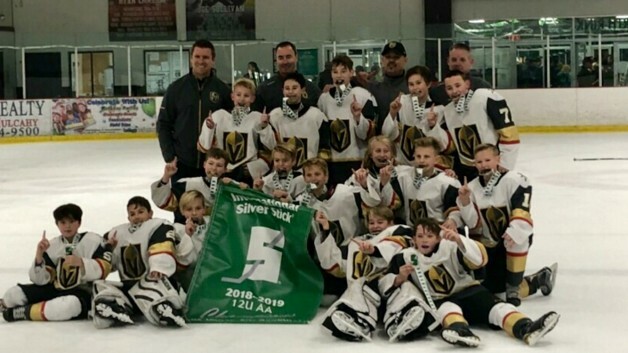 The beat goes on for the Vegas Jr. Golden Knights’ 12U AA team. First, the squad won a regional Silver Stick championship in December (pictured). And recently, it was announced that the team will participate in the prestigious Quebec International Pee-Wee Hockey Tournament from Feb. 13-24. This will mark the first time a Vegas Jr. Golden Knights club will travel to and play in the tournament. Thanks to the partnership with Cirque du Soleil, the club’s travel and tournament expenses will be significantly reduced. The Jr. Golden Knights’ Pee Wee AA team is comprised of forwards Tyler Atchison, Casey Berninger, Jessie Brewer, Jack Lackas, Chayse Laurie, Finn McNabb, Chase Nehring, Caden Ross and Colin Spencer; defensemen Trevor Abele, Connor Beers, Carson Craig, Daniel Maddison and Kaden Mulcahy; and goaltenders Austin Neill and Logan Perez. Head coach Kevin Mulcahy is joined on the bench by assistant coach Bo Lackas and the team manager is Kevin Atchison.